In Europe’s digital policy, digital managerialists, digital frontrunners, and digital convergers have emerged as coalitions among EU member states. This paper lays a focus on their stances on digital-policy reform and on their own understanding of the costs and benefits of the growth of the digital economy. The paper also suggests new ways for countries to cooperate in current or new constellations, which will allow them to profit from other countries’ experiences, and to fully develop their own policy preferences as well as a clear understanding of appropriate digital reforms for them. Digitisation has the potential to support growth in many different sectors and the growing digital economy will make positive contributions to the productivity of non-ICT sectors as well. This is especially true for the services sector. However, countries with smaller digital endowments (e.g. digital infrastructure like networks) often believe that they do not stand to profit as much from digitisation as countries with bigger endowments. That is a profound misconception. Here, it is crucial to note that economic success in the digital economy is actually not merely the absolute level of digital endowments, but rather the way in which these endowments are effectively employed. The European Union and its member states have clearly benefited from the growth of the digital economy. Yet political initiatives to progress Europe’s digital economy – to create a larger space and better regulations for digital entrepreneurs and innovators to thrive – are surprisingly often confronted by political resistance. While every member of the European Union is on a quest to improve digital skills and the capacity of its ICT infrastructure – and, generally, to become attractive places for digital entrepreneurs, innovators and investors – initiatives at the European level have often failed to achieve the targeted ambitions or goals. 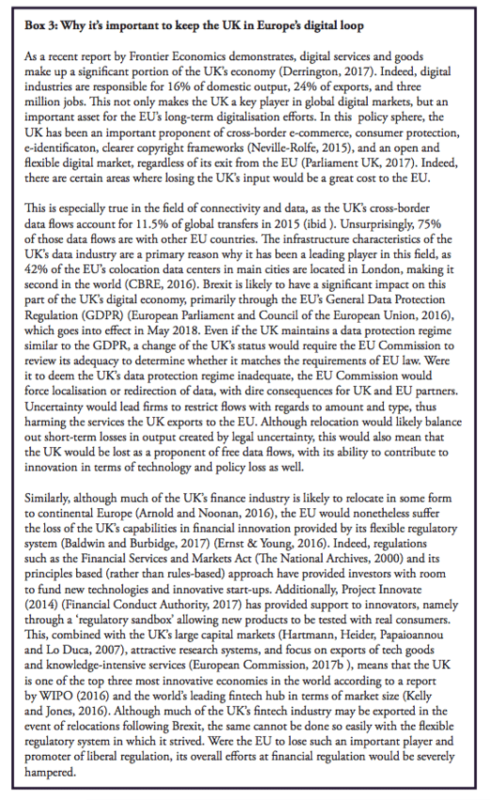 This is primarily (but not exclusively) because groups of members in the EU have taken a restrictive view of how large that space for the digital economy should be and what regulations should apply. Neither the digital economy nor the European Union are alien to disputes about policy and how to reform policy. Just like in previous periods of technological change, the current one provokes aspiration as well as anxiety. For some, there is an underlying (but unsubstantiated) expectation that the digital economy will reduce the economic opportunity of a small or large part of the society. In the alarmist predictions about the effects of digitisation, it is professed that a significant share of the labour force is about to become members of a dispossessed digital proletariat, permanently demoted to low economic expectations. Likewise, there is controversy in the debate about policy details and the more obscure parts of digital regulations. Member states in the EU often differ about the right direction of policy and, just as in other matters related to economic affairs (e.g. international trade and the Single Market), the conflicting opinions follow a pattern. In Europe’s digital policy, there has gradually been a formation of coalitions among EU member states, often reflecting which sectors that are influential in the respective economies. In this paper, we will work with three coalitions and especially review the latter two: digital managerialists, digital frontrunners, and digital convergers. The first group, digital managerialists, is defined by its desire to balance a positive attitude to digital opportunities for societies with defensive economic interests that fear the competition that digitisation encourage. In addition, both attitudes are wrapped up in digital dirigisme, a general disposition and temperament supporting more rather than less regulation of the digital economy. Members of the second group, digital frontrunners, are generally small and open economies that rely heavily on trade and that have high digital readiness (defined by ICT infrastructure, digital skills, and digital use). This group tends to be on the side of the argument that favours deregulation rather than regulation of the digital economy – partly because of own economic interests; partly because of a political culture in those countries that embrace openness to new ideas, technology and societal change. 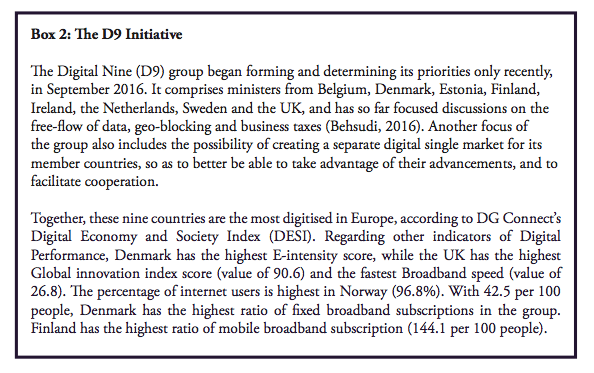 Finally, countries in the last group – digital convergers – are catching up on other EU members, in terms of both economic prosperity and digital performance. While their ICT infrastructure is generally good, these countries are still trailing others in digital skills – and, with substantial digital inequality, broad-based economic benefit from digitisation are held back. Furthermore, a good part of their economy is based on the production of parts, components and services to multinational firms – and many digital convergers are uncertain about where in the digital value chain they stand and if greater openness to growth, competition and experimentation in the digital economy can allow them to climb that value chain at a faster rate. While the policy character of these groups has gradually been articulated, it is less clear what two of the groups – the digital frontrunners and digital convergers – actually want to achieve in EU policy on the digital economy. It is obvious to any observer of digital politics where the source of resistance can be found and how the digital managerialists have maneuvered to slow down the pace of policy change. It is equally obvious why some of the countries in this group feel that things should slow down: they are articulating the politics of defensive corporate interests that want more time to adjust to new technologies and patterns of digital competition. However, it is less obvious what the digital frontrunners are trying to achieve. While they are clearly supportive of a policy that releases the forces of growth in the digital economy, they are seldom taking positions that stake out future ambitions or set a path for where Europe’s digital economy should go. Until recently, they have been somewhat hesitant to seek coalitions with other countries. Generally, their strategy seems to have been focused at supporting most initiatives launched by the European Commission. Similarly, it is unclear what the convergers want to achieve, other than general ambitions to expand their ICT capacity. On matters of EU-based market and regulatory policy for the digital economy, they are often sitting on the fence, without a clear idea of where their own economic interest lies. While they often go along with soft digital reforms, they do not seem to have a policy for how they want to use EU policy to support their digital growth. The purpose of the paper is to shed light on the politics, economics and political economy of digital-economy reform in Europe – and to delineate what should be the policy positions of various groups of countries. 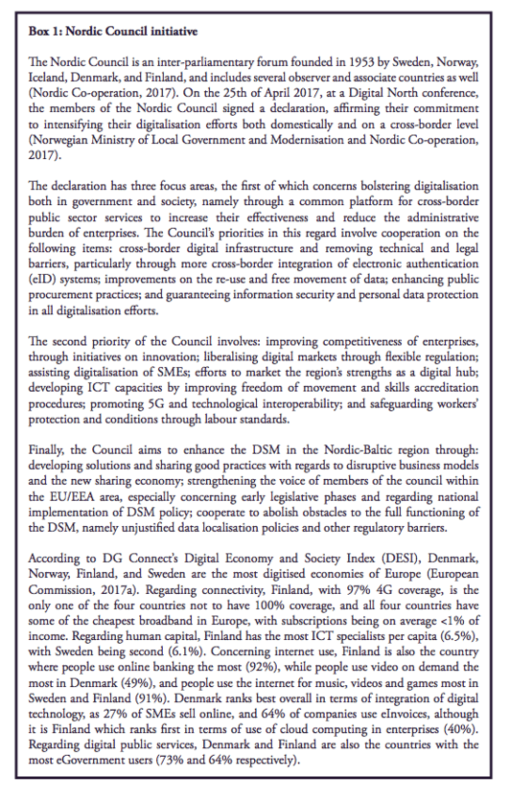 The paper will consider their stances on digital-policy reform and suggest various ways for countries to work with each other in current or new constellations – all with the purpose of reinforcing the understanding of their costs and benefits of the growth of the digital economy, and what should be appropriate digital reforms for them. Before we start that, however, we first need to set the scene for the discussion – and dive deeper into the various groups this study will work with. The emergence and growth of the digital economy has been a boon for Europe. It is, by some distance, the fastest growing economy in Europe – and in the rest of the developed group of economies. According to the Organisation for Economic Cooperation and Development (OECD), digital output among its member economies has been growing at about 10% per year for the past five years. It is now an economy that also employs a lot of people and, despite fears about digital innovation disrupting incumbents and leading to a net loss of jobs, the reality is the opposite. In France alone, suggest a study by McKinsey, the digital sector has led to a net addition of 70,000 jobs. These are impressive rates of growth – and all the more so when it is taken into account that the digital economy now has become sizeable and does not show high growth rates because it is small. Accenture, the consultancy, estimates that digital output already represents about 25% of Europe’s total gross domestic product (GDP) – or 3.6 trillion euros – and, consequently, that the share of digital output in Europe’s GDP is higher than the global average at about 22.5% (see Chart 1) (Accenture, 2016). Already achieved growth has emerged on the back of sizeable investments in creating good ICT capacities and digital endowments – telecom networks and digital skills among them. Governments have also promoted policies that have opened sectors up to new digital innovation. Recently, member states have also given their approval of Europe’s flagship policy initiative for the digital economy – the so-called Digital Single Market (DSM) agenda. Undoubtedly, this is an initiative with great economic potential. If there would be a Digital Single Market, supporting openness to data and data services, there would be far fewer restrictions in Europe to digital entrepreneurship and commerce, and there would be better protection against future actions that would increase the regulatory burden on the digital economy. A fully integrated market for the digital economy would support the non-digital economy in many ways, and help producers and consumers to make the best of their limited resources. Rightly, EU leaders have used the example of e-commerce to drive home the point that the digital economy needs fewer regulatory barriers. For instance, the European Commission found in a study of a basket of 100 goods that consumers could save up to 745 euros (or 16% of total expenditures) if they purchased them online across the EU. In six out of 10 cases, however, such transactions could not be completed because of various barriers. If policies clogging the arteries of e-commerce were eliminated, total consumer welfare gains would exceed 200 billion euros per year. Policies that establish open and predictable rules for the digital economy will reinforce the positive economic impact of digitisation. Rules that open the economies for more digital competition and innovation, from home or abroad, will raise growth and give consumers better value for money. Such rules are important because, across the world, there is always a temptation to introduce detailed and granular restrictions, many of which fail in the implementation. Part of the temptation comes from the undeniable fact that some issues around the digital economy have been politically controversial and sometimes prompted opposition because of fears that the digital economy may erode the competitiveness of some of its leading firms. Obviously, hesitant reactions often reflect the unpreparedness for digital renewal in non-digital sectors. While sectors and companies close to the digital frontier have been quick to embrace new opportunities to raise competitiveness and productivity, others have been lagging behind, especially in countries with a high share of small and medium-sized enterprises (SMEs) that are struggling to catch up with the technological frontier. A fully integrated digital market in Europe would help SMEs to profit on the back of digitisation. 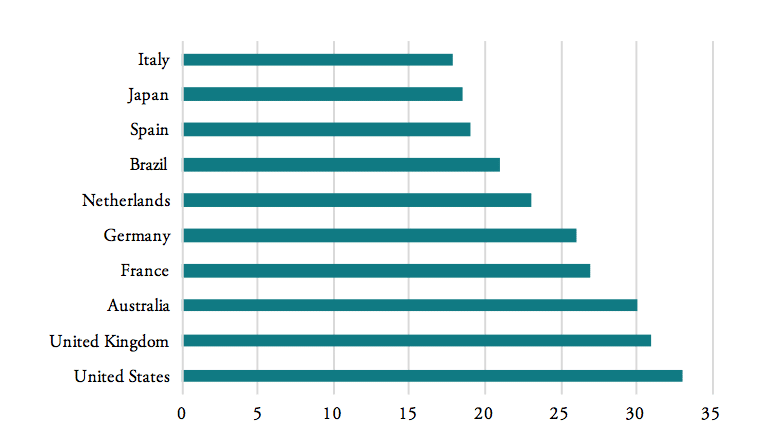 In countries like Italy, for instance, there is a high share of non-frontier SMEs – more than 50% of all firms are non-digital and just a little more than 1% of all firms are fully digital (see Table 1). For Italy to catch up economically, it is important that its firms get closer to the technological frontier. All too often, however, SMEs in Italy and elsewhere find it difficult or expensive to access necessary technologies and skills, especially when there are restrictions on platforms or cross-border access to digital services. A great asset in the Digital Single Market is that it would help to converge SMEs to the frontier by easing the diffusion of digital technologies and services in the economy through reduced barriers to get the digital capacities they need in order to compete. Reducing the barriers to the digital economy would also boost Europe’s platform economy and create better conditions for domestic platforms to grow. In recent years, the rise of online platforms has been viewed by some in Europe as problematic, partly because restrictions to digital business in Europe are high. Europe trails behind both the United States and the Asia-Pacific region in encouraging successful platform enterprises. According to the Center for Global Enterprise, while 27 digital platforms, with 109 000 employees and a combined market capitalisation of 181 billion US dollars, were created in Europe, the Asia-Pacific has seen the creation of 82 digital platforms with close to 350 000 employees and combined market capitalisation of 930 billion US dollars. Both regions do not come close to the combined market capitalisation of US-based digital platforms – about 3 trillion US dollars (Evans and Gawer, 2016). Despite fears about job-losses to follow on the heels of digitsation, there is a strong and positive case for digital innovation that often gets lost in the debate: technological transformations create new firms and jobs. And that is badly needed in a Europe that has high unemployment, not least among young generations, and that has witnessed declining churn rates of firms over the last decade, if not longer. Today, the rates of firm entry and firm exit are lower than before, which suggests that the problem confronting Europe is not one about galloping technological change in the real economy. The consultancy Accenture estimates that Europe’s digital economy will have grown by one trillion euro by 2020, leading to new business creation and jobs. In Europe as a whole, a Digital Single Market would add almost four million new jobs, according to the European Parliament’s Research Service. Europe’s exposure to digital innovation in other areas of the world is a key part of the current and future success. Not only are many European innovators and companies supplying services to the American digital firms, but access to the services offered by these firms have helped to create a more productive European economy. While it is impossible to distinguish the effects of foreign ICT firms on Europe’s productivity growth, ICT sectors have represented between 35 and 50% of Europe’s total factor productivity growth in the past 15 years. Furthermore, foreign ICT providers give European firms greater capacities to compete and raise revenues. For Europe’s businesses, having undisrupted access to digital services is key to their ability to compete. Closing Europe off from the digital world would have serious consequences, especially for Europe’s community of small and medium-sized firms that cannot afford to build up their own digital services. Digitisation supports growth in many different sectors – and the general case for the digital economy is that it will make positive contributions to the productivity of non-ICT sectors. However, this is where Europe has a clear challenge, especially in the services sector. Benchmarking the general composition of productivity growth in the EU with the U.S., which has a similar balance between manufacturing and services in its economy, is instructive, and gives an indication about how the European economy could grow faster by expanding the digital economy. It is not just a matter of investment in ICT, but also what happens in the broader services sector when the economy gets transformed. Obviously, the European services sector growth has trailed the expansion in U.S. services. The same is true for productivity growth, and what contribution the services sector gives to general productivity growth. The McKinsey Global Institute has estimated the productivity gap in business services between the EU and the U.S. to be as high as 43%. Chart 3, below, gives further evidence to that observation. It shows the contribution of major industrial sectors to aggregate productivity growth in the U.S. and the EU for the period between 1995 and 2007. The difference between market-service contributions is striking: 0.6 percentage points for the EU against 1.8 percentage points for the U.S. Similarly, other estimates show that between 1995 and 2005, business services contributed 0.7% annually to productivity growth in U.S. commercial services and -0.1% annually in the EU. In other words, that sector drained the economy of productivity, and that is remarkable given how it has been supporting productivity in other countries through digitisation. It is all the more remarkable when it is taken into account that business and commercial services include a wide range of highly diversified ICT services (such as programming, data facilitation and storage) and digital marketing services. Another way of looking at the same issue is to consider the diffusion rates of technology in European economies. Obviously, frontier firms – usually larger and internationally competitive enterprises – adopt new technologies and grow their productivity faster than other firms. What defines the scope of productivity for the entire business sector is what happens in non-frontier firms. 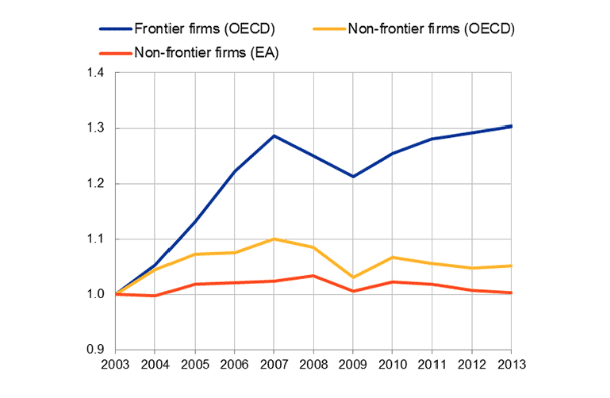 In the manufacturing sector, firms in the Euro area have faster rates of productivity growth than non-frontier firms in the OECD as a whole. In services, however, it is the opposite relation (as shown in Chart 4 below). While there are several explanations behind Europe’s trailing services sector, it has been known for a long time that a key problem is related to the rate of technology diffusion in the sector of services SMEs. This is why a chief ambition for Europe should be to raise the level of technological and digital intensity in its entire economy – and to ensure that the restrictions to technological diffusion are reduced. Initiatives in Brussels to reduce the barriers to digital enterprise in Europe – and to establish a Digital Single Market – have generally conformed to the desire of accelerating digitisation and raise its positive economic impact. While many of the initiatives taken have encouraged such change, it is equally important to note that several initiatives have fallen short of the ambition to create a Digital Single Market. Furthermore, it is equally clear that many policy initiatives did not deliver in accordance with their initial plans, primarily because policy reforms were weakened and ambitions reduced once the initiatives became the subject of member-state political haggling. In particular, the DSM initiative is falling desperately short on policies that deregulate sectors. 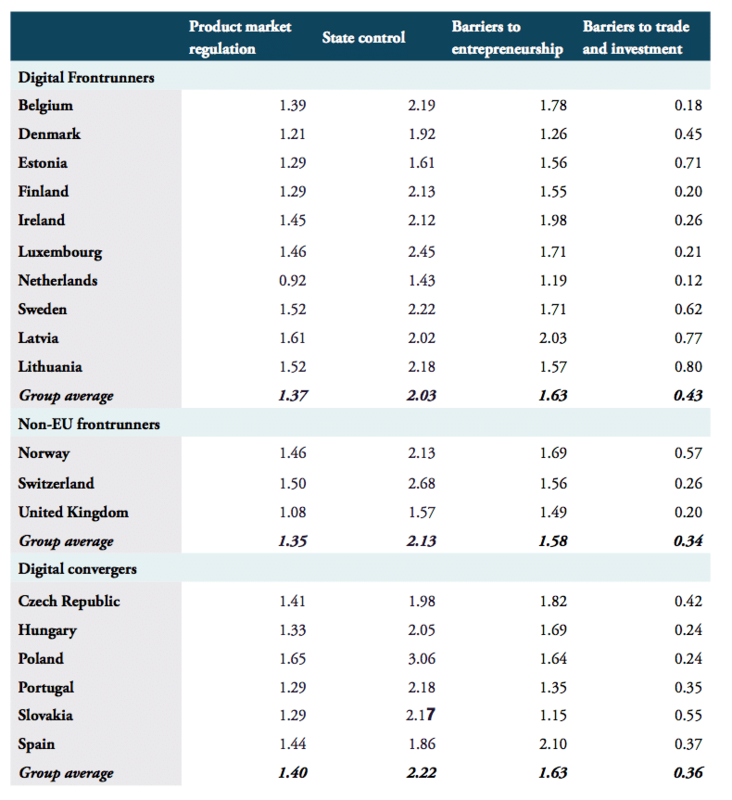 As countries have agreed on establishing new digital regulations, but not opened sectors up for more digital opportunity, the reality on the ground – felt by many companies, especially small entrepreneurs – is that the digital economy is increasingly depressed by heavy-handed regulations that have raised the total level of digital restrictiveness. Generally, positions taken by member states in those matters tend to follow the three different coalition formations that were outlined above – digital managerialists, digital frontrunners and digital convergers. These groups, in turn, broadly reflect how member economies perform in various indicators of their digital intensity – and their general pre-disposition to policies of regulation and openness to market-led structural economic change. Let us consider some of these indicators – especially for the two groups that we chiefly are focusing on in this paper: digital frontrunners and digital convergers. As we are talking about policies that affect EEA countries and Switzerland – and the soon-to-be departed United Kingdom – we have divided the frontrunner group in two categories – EU and non-EU. The next three tables lay out the performance of groups and countries in different measurements and indexes of digital intensity. The general conclusion is clear: digital frontrunners are ahead of digital convergers in all scores. They have better ICT infrastructure – or connectivity; they have better digital skills and use the Internet more frequently. They have a greater digital “deepening” in their economy – digital output plays a greater role for them. If we would compare these performances with a country like Germany – in our view, a digital managerialist – it would be somewhere between these two groups, often closer to the digital convergers than the frontrunners. The measurements displayed in tables 2-4 concern tangible – and often material – aspects of digital performance. Obviously, they are important; the better the digital endowment of a country, the more that country is likely to generate high economic growth on the back of digitization. Yet economic indicators alone do not give the full picture. Arguably, there are good reasons to add two countries to the group of digital frontrunners that usually are not found in that category, and that show a digital performance that is trailing frontrunners and, in some indicators, is closer to digital convergers. These countries are Latvia and Lithuania. There is a simple reason for this choice: both Latvia and Lithuania have made substantial progress in their digital performance and – more importantly – they are generally economies that support the policy ambitions of digital frontrunners. Moreover, these two countries are generally very open and trade-dependent economies with little choice to substitute imported technology adoption by domestic technology creation. Importantly, the policy culture in these two countries is generally progressive on matters related to technology and technological change. Like other digital frontrunners – such as their neighbors Estonia, Finland and Sweden – it is likely that Latvia and Lithuania would favour a larger space for the digital economy even if they were uncertain about its economic benefits. And this is a distinguishing hallmark of all digital frontrunners – they have a “policy instinct” in matters of the digital economy that is based on openness to technological change and its ensuing effects on the society. In this chapter, we have argued that the growth of the digital economy has generated strong benefits for the European economy. Despite that, new initiatives to advance the digital economy are often confronted by resistance from some countries – and that resistance often comes from digital managerialists that fear reforms to either be misdirected or encouraging new forms of competition at a pace which is too fast. While it gradually has become clear what digital managerialists fear, it is less obvious what digital frontrunners and digital convergers desire – or what they want from new policy at the European level. Frontrunners usually give their support to efforts by the European Commission to cut the barriers to digitisation and digital commerce in Europe, but they seem to take for granted that most proposals conform to that agenda and that there is not a need to raise the level of ambition for what the EU should aim for and at what speed. Moreover, few of the frontrunners seem to have an idea of what defines a Digital Single Market and how current proposals score in that context. Importantly, digital frontrunners do not carry an idea for how their group could expand – and how they could join forces with digital convergers that aspire to become frontrunners. One of the authors of this paper examines this issue in Erixon and Weigel, 2016. Digital managerialists have, for example, supported platform regulation and the break-up of US tech firms, and they have been skeptical of – if not hostile to – digital single market reforms like the free flow of data. They are also hesitant about creating a single market for services in Europe that would allow for more digital competition in non-digital sectors. Business services include not only professional services (accountancy, legal, engineering, marketing, tax and management consultancy, architects), but also IT, software services, technical testing, and labour search services etc. Business services are mainly used as inputs by other firms. There is one aspect where digital convergers differ from frontrunners: their digital endowments are less well developed. Consequently, a key ambition for increasing the growth potential of the digital economy in converging countries is to expand their ICT capacity and their digital human capital. 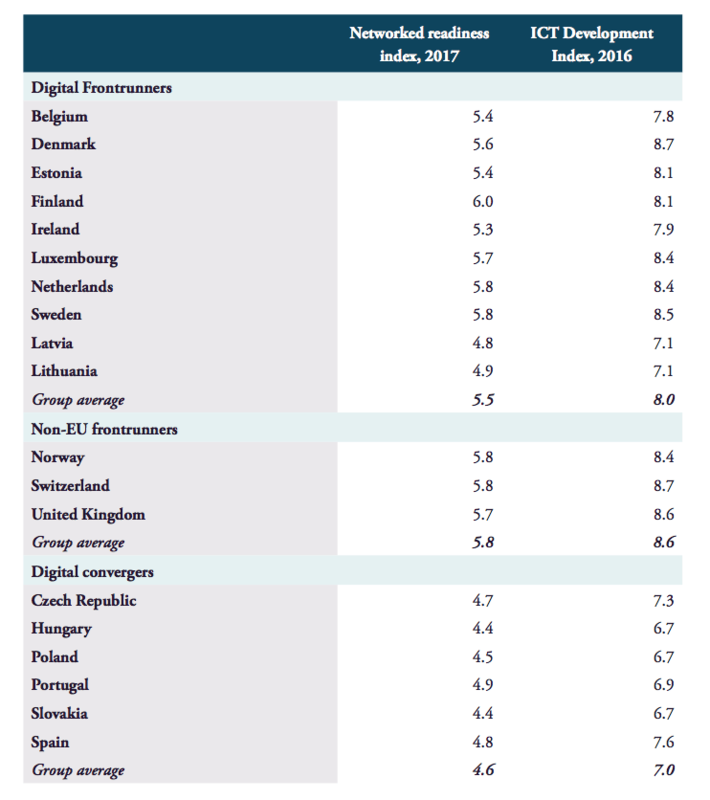 Using the two main global digital indexes from the previous chapter as a benchmark, digital convergers only perform with an average of 4.6 in the Networked Readiness Index and 7.0 in the ICT Development Index – scores that can be compared with those of EU frontrunners (5.5 and 8.0) and non-EU frontrunners (5.8 and 8.6). 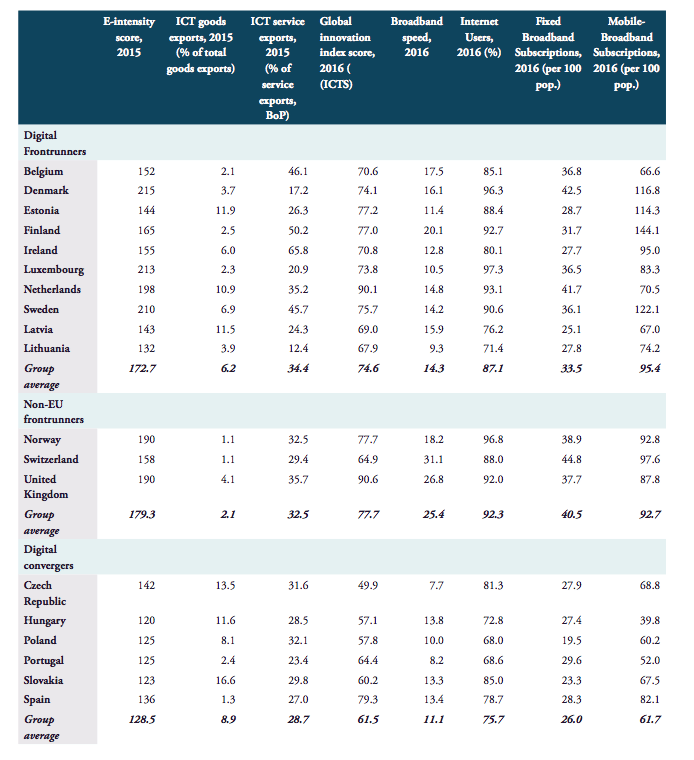 The same is true for the total average group scores in the European Commission’s Digital Economy and Society Index (DESI) as well as the standard digital performance indicators outlined in tables 2-4 in the previous chapter: digital convergers are still catching up. Their lower level of digital endowments is often translated, also within the countries in question themselves, into a perception that they have a low ability to profit from opening up to the digital economy. Smaller endowments are often seen as reducing the competitiveness of these economies – and a reason to be hesitant about promises of growth to follow on the heels of digitisation. However, that is a gross misreading of the economics of the digital economy. Endowments are only one side of the equation. What is key for economic success in the digital economy is actually not the total amount of digital endowments, but rather how the endowments are employed in the economy. Or to put it in different terms: how countries are using their comparative advantages. Obviously, all countries cannot be at the top at the same time, but just because endowments are smaller does not mean that countries do not stand to benefit from new digital opportunities. Just like the entire economy, the patterns of rewards in the digital economy are based on an exchange that exploits the comparative advantages of countries. And by that standard, both digital frontrunners and convergers are actually doing pretty well. To see how – and what different countries can do to improve their relative performance – let us consider the chart below. 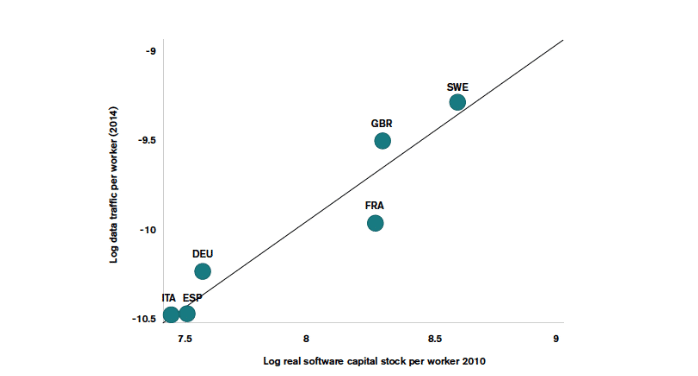 Chart 5 shows that countries do not need to be equally endowed with a stock of digital investments and capacities in order to reap positive economic benefits: what is more important is how the stock of endowments, in this case measured by software capital per worker, is used in order to generate output. Some countries have built up a very large stock of data or computerized information – in the digital economy, this is a good benchmark of digital endowments – and, as can be seen, frontrunner countries like Sweden and the United Kingdom are well ahead of other countries. The size of the endowment – measured on the x-axis – does not say anything about whether Sweden and the UK are performing well, if they are utilizing that endowment or if there is a lot of underemployed capacities in the economy. The important metric is how close they are to the mean or fitted-values line, which measures how they – relative to other countries – are embedding their data endowment in the economy, in this case a measure of output like data traffic per worker (the y-axis). The conclusion is that countries above the line are, relative to others, using their digital endowments more and that for every unit of software capital added to the endowments, more data traffic is generated than in other countries. Just like with other investments in endowments, output is not generated just by adding more endowments – and the real key to economic success is to improve the utilization of the stock of capital that exists. Using the same concept of performance relative to others, is there a way to get a sense of what factors are preventing countries from better exploiting their digital endowments? Take the case of Germany, a leading digital managerialists in Europe. Obviously, what sets Germany apart from the rest of the EU is not poor digital endowments: its digital capacity is comparatively strong. But the digital intensity of its trade is below what is expected from a country with Germany’s digital capacity, and what stands in the way is not policies that prevent individuals to exploit their digital skills. A larger problem is gap between German firms and EU frontier firms in their use of digital technologies, services and business models. Policy initiatives are currently lacking a focus on removing obstacles and creating incentives for businesses to make use of these endowments. However, such increased usage of digital endowments by businesses would be crucial for increasing the competitiveness of Germany’s economy in the future (Deringer, Erixon, Lamprecht and Van der Marel, 2017). Germany is not alone in Europe of underperforming relative to its capacity, and table 5 shows the result for the EU membership. Another way of illustrating the same conclusion is to look at factors such as the position of countries within the value chains of the digital economy. In view of their endowments, digital convergers perform rather well as many of them are already plugged into the value chains of ICT manufacturing or ICT services such as back-office operations. Forward linkages, i.e. the domestic value added embodied in foreign exports, can be seen as a measure of integration into international supply chains. Chart 6 shows these linkages in international supply chains of digital convergers from 2001 to 2011. While their contributions to forward linkages were already significant in 2001, they have further increased in the case of all digital convergers. This shows that many of the convergers are generally creating more value-added in their economies by connecting their economies to the arteries of the value and supply chains of foreign companies. In other words, even if many countries in this group have few multinational companies that trade directly from their home country with the world, the countries have prospered by a smart use of endowments in international value chains. The same logic also applies to digital value chains. Digital convergers are already established in international value chains and, even if their endowments remain distant from the frontrunners, the output they create from current digital endowments is significant and contributes substantially to their economies. They are in competition with other economies in the world that have similar positions in international value chains and they are on a trend of fast acceleration of their digital competitiveness. This is illustrated, for example, by the fact that the digital economy has contributed to the centre of economic gravity shifting away from Europe to Southeast Asia in recent years. This trend is estimated to continue with the centre of economic gravity further shifting to the Asia-Pacific region until 2025 (Erixon, 2017). The integration of digital convergers into international value chains has further contributed to the openness of their economies. Their economies show a significant degree of openness which is comparable to that of digital frontrunners. As chart 7 below points out, the trade ratio of digital convergers is comparable with that of almost all digital frontrunners, and their average trade ratio is even higher than that of non-EU digital frontrunners. In other words, these are already economies for whom openness and linkages to other economies are crucially important. In that way, they are similar to the digital frontrunners. They are both damaged by digital restrictions that prevent these linkages to operate fully. The future task for digital convergers lies in both generating more output from their accumulated digital capital, through climbing the value chains of the digital economy, and expanding their digital endowments. To do so, they need better market conditions for the digital economy and more investment in digital capacities and skills. Better market conditions will enable them to exploit their comparative advantage in the sectors in which they are specialised. Indeed, better conditions are necessary for the efficient use of these countries’ accumulated digital capital, which in turn also incentivises more investments. For digital frontrunners, the future challenge is more skewed towards improving market and regulatory conditions to allow for more output on the back of their digital endowments. Different aspects are important for achieving such improved market conditions. The overall reduction of the total number of product market regulations, as well as reducing the restrictiveness of existing regulations, are effective policy measures. Heterogeneous product market regulations across the economy prevent competition in the economy (Bauer and Erixon, 2016). This is especially true when it comes to the crucial role of non-digital sectors for the growth potential of the overall economy. Product market regulations prevent the use of ICT from entering into non-digital sectors, where it can especially result in efficiency gains and contribute to enhanced economic growth. Table 6 outlines the product market regulation index with different indicators for digital frontrunners and digital convergers. Considering the overall product market regulation index value, the restrictions of digital convergers are on average still higher (index value of 1.4) than those of digital frontrunners (1.37) and non-EU frontrunners (1.35). 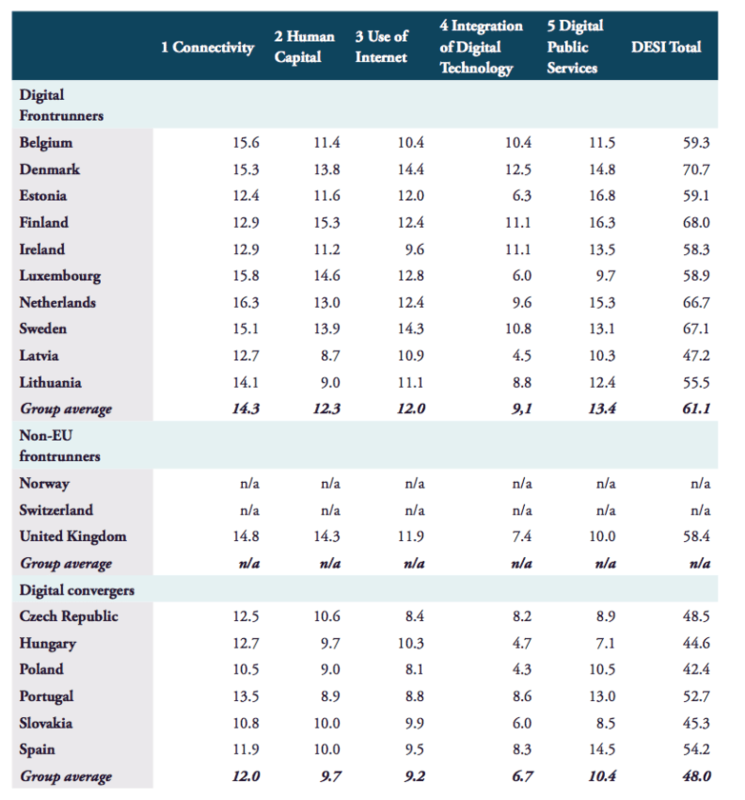 This is especially true for the indicator of state control, where digital convergers on average score higher (2.22) than the group of digital frontrunners (2.03) and non-EU digital frontrunners (2.13). These stronger existing barriers again illustrate the potential for digital convergers not only to profit from further openness to the digital economy in the future, but indeed to profit from it to a larger extent and at a faster rate than digital frontrunners. 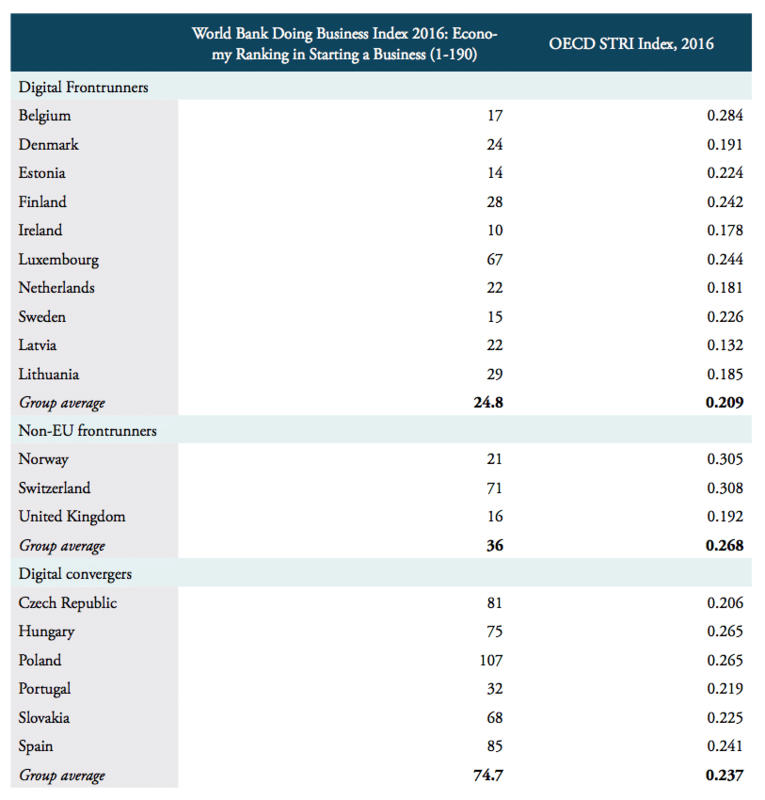 As indicated by the OECD’s Services Trade Restrictiveness Index, services restrictions among the digital convergers are relatively higher than those in the frontrunners group. Further reduction of the amount of regulations and of the restrictiveness of existing regulations would allow these countries to profit from increased efficiency gains, as well as resulting economic competitiveness and growth. However, their level of restriction is still broadly comparable to those of the frontrunners and it is even lower than the average level of restriction among the non-EU frontrunners. Note that the level of restrictiveness of Lithuania, and especially Latvia, is below the average of digital frontrunners, further justifying their inclusion in this group. Other crucial elements for achieving improved market conditions are high employment protection, private credit provision, patent application open to non-residents as well as high R&D expenditure (Van der Marel, 2016). In addition, policies supporting the entrepreneurial spirit is a key element for taking and further developing comparative advantage. Support for start-ups especially in non-digital sectors is key, as start-ups rely heavily on the use of software and ICT for their business models in these sectors, too. Companies have to adapt to modern forms of operation due to technological change, which can be described as the process of digital business transformation (Forbes, 2017). In order to remain competitive and to withstand digital disruption, companies have to be able to develop their digital business agility. Environmental factors, such as policy intervention, are a crucial factor for this process, especially for SMEs and start-ups. Reduced product market regulations in these sectors are an important factor for attracting investment and increasing economic growth. According to the World Bank’s Doing Business database, digital convergers could still improve their position in this area. Their average position in the ranking from 1 – 190 is only 74.7, which is behind the average of the digital frontrunners with a score of 24.8 and of the non-EU frontrunners with a score of 36. 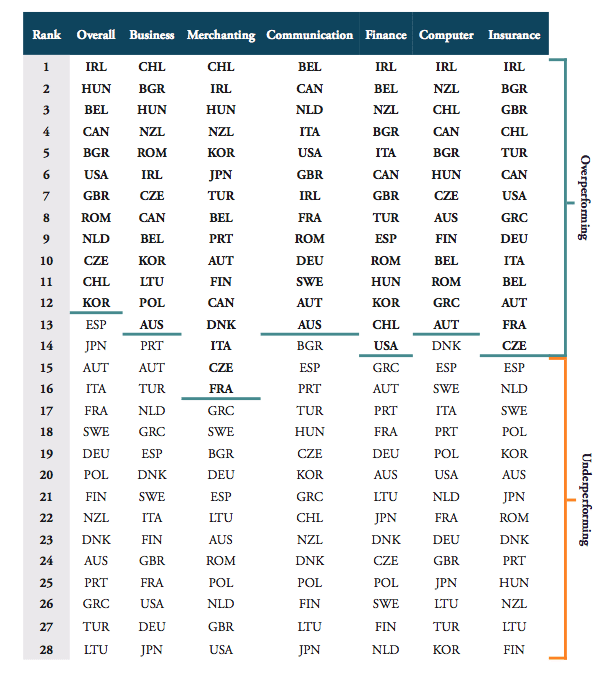 Also, note again that Lithuania, and especially Latvia, have rankings that are fully in line with the digital frontrunner average, again confirming that they can be considered to be part of this group (see the table below). See: Van der Marel, E., Lamprecht, P., Deringer, H. and Erixon, F. (2017). Boosting Services Trade in the Age of Digitalization: What is the Potential, What are the Obstacles? Gütersloh: Bertelsmann Stiftung. Equally important, both groups of countries need to find ways to better articulate their policy interests – in the short as well as the long-term – and to build alliances with the purpose of impacting the future policy direction. While there have been some step-wise improvements of digital policy in Europe over the years, the reality is that both frontrunners and convergers have digital economic interests that have not been responded to by policy decisions at the EU level. For example, the Digital Single Market initiative has yet to provide a policy of substantial liberalisation. New regulations have sought to complicate data flows with countries like Australia, Korea and Japan – countries with high-standard protection of data privacy – simply because their data regulations are not identical with those in Europe. New companies like WhatsApp, challenging incumbents in the telecom sector and bringing new services to people with constrained high-quality access, are exposed to overly burdensome regulations. In member states, if not the EU, new platforms have been rejected rather than embraced – some of them are deemed to be anti-competitive despite bringing substantial improvements in markets and competition to a great number of sectors. The list goes on – and leads to a depressing account of current policy: it reflects the interests of less open economies with fewer instincts for competition rather than those economies that are heavily plugged into the world economy. What can various country groups do to change this trend of policy? In this chapter, we will look at some initiatives that can be taken by digital frontrunners as well as digital convergers, in order to build coalitions for policies that would support faster growth of the digital economy and improve the positive economic impact of digitisation. Initiatives to foster better collaboration between digital frontrunners is not a novel idea. Countries in that group already meet – together with other EU member states – to discuss and coordinate positions in Brussels. A more exclusive group of frontrunners have established the so-called Digital9, or D9, initiative with the purpose of fostering a stronger policy coalition. There are also various combinations of individual countries that meet in other fora to charge new ground for the development of the digital economy. One such initiative is the Nordic Council, a very established forum of government-to-government cooperation, with a Council of Ministers and a secretariat, that also includes non-EU countries like Norway and Iceland. Earlier this year they met to discuss the concept of the “Digital North” and adopted a political declaration stating that “The Nordic-Baltic region is well-positioned to show the way for digitalisation in Europe”. At a June meeting this year, a new cross-sectional Council of Ministers was established to work specifically on matters of the digital economy between 2018 and 2020, and it has been equipped with a budget that is tied to developing policies for the Digital Single Market. Undoubtedly, this is a promising initiative. Nordic countries are at the global frontier of the digital economy and many of the countries in the region top global rankings over digital readiness and technological capacity. In other words, they have substantial digital endowments. They can also provide examples – positive and negative – to other countries about reforms and investments that support a rapid expansion of the digital economy and redouble the positive economic impact of digitisation. The sharing of these lessons between countries in the group will be helpful to all participating countries. If they can also take them to countries outside of the Nordic Council, the impact can be much larger. Observers of the discussions held at these meetings, or the initial discussions over the D9-initiative will, however, find that there is another obvious task for these group initiatives: to articulate an idea for what digital frontrunners want to achieve in EU policy over the medium term and draw conclusions for what that idea entails in the short term. Discussions between digital frontrunners still remain weak on substance and all-too-often become an exercise responding to adverse events and policy trends in the short term. There are only fragmented thoughts about the medium and long-term agenda, for instance what the Digital Single Market actually should become and what policies stand in the way for actually having one. This is not surprising. Even if the digital economy has been a central feature of the economy for a long time now, it is one that has constantly raised new types of issues and increasingly prompted new considerations about what policies will actually drive its expansion. It is only recently that it has become a clear concept in policymaking that the digital economy is not one sector that will be supported or stymied only by digital-specific policies, but that its real potential is the degree to which digital technologies can be embodied in non-digital sectors. But the fragmented notions about how digital frontrunners want to progress policy over a longer period of time point to a very clear task for new initiatives: while day-to-day policymaking will always occupy the minds of ministers and governments, it is important for the success of policy that the same actors invest time and thought in developing what policy initiatives should come next and what they would want from new initiatives for the Digital Single Market. In the EU, this is only work that can be done by the frontrunners, and it is work that will be useful in the short term as well. All too often, frontrunners end up in an awkward situation in Brussels’ discussions where they have to rally all their support behind an initiative from the Commission in order to avoid it being diluted by other member states. But in the transactional and compromise-based policy culture of the EU, supporting the Commission means that the Commission position becomes one of the extreme positions, and one that will not be the basis for an EU agreement. The task of the frontrunners should rather be to stake out a position that goes much further than what the Commission proposes. For that to happen, however, these countries need to know where they want to go, and that remains an idea that has not been articulated, let alone thought through by governments. The new forms of collaboration that are established should aim to establish policies that are exclusively in the interest of the frontrunners. Given that many of these issues are not EU-specific issues, but involve domestic policies as well as global policies, governments do not need new forms of cooperation in addition to EU membership and EU policy. Rather, they can rather allow a larger degree of flexibility and base cooperation on the participation of governments and ministers that have ambitions and want to see them materialise. For the D9 group of countries, there should be some new thoughts given to countries that should participate in addition to current members. For example, there are good reasons to consider the membership of some non-EU countries like Norway and a country that soon is about to leave the EU – the United Kingdom – but whose policy instincts in matters of the digital economy should remain in the European domain. There are other candidates as well to consider, but the key point is that the D9 group of countries is not attractive because the ranking of these countries in digital indexes, but for its ambitions and capacity to build a policy idea that goes widely beyond current policy debates. While an obvious target for new policy ideas developed in that group will be the European Union, they should not condition the participation on the exact form of relation to the EU. After all, EU as well as non-EU countries have a big stake in developing a digital economy with few restrictions to cross-border integration and that can easily embody new technological innovation in the future. However, the exclusive role of the D9 group of countries arguably rules out the participation of countries that are not digital frontrunners. The task of that group, therefore, should be to build an inclusive agenda involving other countries with less digital capacity, or that come with an interest to focus the agenda on matters that are about moving the goalpost for the future and developing the concepts and ideas of policy that will guide how policy evolves over the next decades. There is a role for forms of cooperation that build support for ambitious policies in the short term and that can better serve as a “docking station” for countries that want EU policies to become better suited for the digital economy. The role of such initiatives is neither to come up with bold ideas, nor to be a hub for frontrunners, but to build a coalition for a digital economy in Europe that is open and supports the economic integration that many countries have already achieved. There will be a role for bilateral and region-to-region cooperation in that space. Often, the capacity to build political coalitions depends upon the personal chemistry between ministers and heads of governments, and the degree to which there is a good rapport between them on specific issues. An example of this is how the personal relation between the former Swedish Foreign Minister, Carl Bildt, and the former Polish Foreign Minister, Radek Sikorski, became the basis for the launch of the Eastern Partnership initiative. Such developments are also underway for the digital economy. The digital economy is now front and centre in many bilateral relations between governments in Europe and there is also an increasing need to find areas where there can be a good atmosphere of cooperation. Countries in the Benelux and Visegrad have already started to schedule meetings at high political levels to discuss how they see the future of EU cooperation, and it makes sense to give the digital economy a central role in these discussions because it is an area where these regions are converging. Likewise, Nordic countries are increasingly engaging with Visegrad countries and the geographical proximity between some of these countries, along with their shared interest in encouraging faster digital growth, is a good platform for policy oriented discussions related to EU policy. However, bilateral relations can only move policy cooperation a bit – and they are no substitute for more structured cooperation when the purpose is to build new coalitions. They are the glue that can make more institutionalised forms of cooperation work smoothly and be fed with new ideas, but there is an important role now to make sure that there is a platform of digital frontrunners and digital convergers to regularly meet with the purpose of establishing a coalition for positive policy change. That platform can be a ‘Friends of the Digital Economy Group’ that will gather frontrunners and convergers that are members of the EU. By our calculation, that would be the “D16 group of countries” – a group of 16 members that have a comparatively high degree of economic openness and that is committed to building a Digital Single Market in the EU that reduces barriers to digital integration and enterprise at a fast rate. The agenda of that group should follow the EU policy cycle, but allow for the entire group to take initiatives in the EU. Apart from encouraging bolder steps for building the Digital Single Market, this group should put a lot of emphasis on the competitiveness agenda for Europe. Despite some variation between countries in their economic and domestic policies, they share a pretty liberal view on the economy that includes expanding entrepreneurship and improving the conditions for SMEs to grow. They are not supportive of digital dirigisme – nor do they take the view that there should be a defensive industrial policy for the digital economy that protects incumbents against new competition from digital entrepreneurs. For the D16 initiative to leverage policy it should build a virtual infrastructure around it that ensures that it is given high political attention. An annual summit for heads of governments would help to give it political weight. A schedule of regular meetings of relevant ministers would force attention given to the agenda. A D16 Business Group attached to it would use the energy of businesses and help to shape an agenda that reflects real market problems. A separate chairperson tasked to manage the agenda would ensure continuity so that agreed priorities and positions are delivered. Digital convergers share a similar degree of openness with digital frontrunners when it comes to openness to trade and regulatory freedom, for example, with regard to product market regulations or services trade restrictiveness. However, digital convergers are behind digital frontrunners in their digital endowments, and hence the forms of cooperation that digital convergers should encourage need to be based on two components: setting the right type of market regulations for the digital economy to grow and supporting investment in digital endowments. Generally, digital convergers have strong economic interests to associate themselves with the digital frontrunners. They can import digital endowments and policy experience from them. Importantly, they both have companies focused at exploiting their comparative advantages in value chains and frontrunners have examples to show convergers how they can climb these value chains faster. Given their tight economic integration with the European and global economy, digital convergers have an interest in ensuring digital success for countries that are closer than them to the digital frontier, or that actually is at the frontier. However, digital convergers can start closer to home. There is a clear role for greater regional cooperation between countries – cooperation that seeks to build regional coalitions and share experiences of what has worked well in regulatory policy and the investment in digital endowments. Existing groups such as the “Visegrad Group” or “V4” can therefore be expanded and given a clearer purpose in matters of the digital economy. 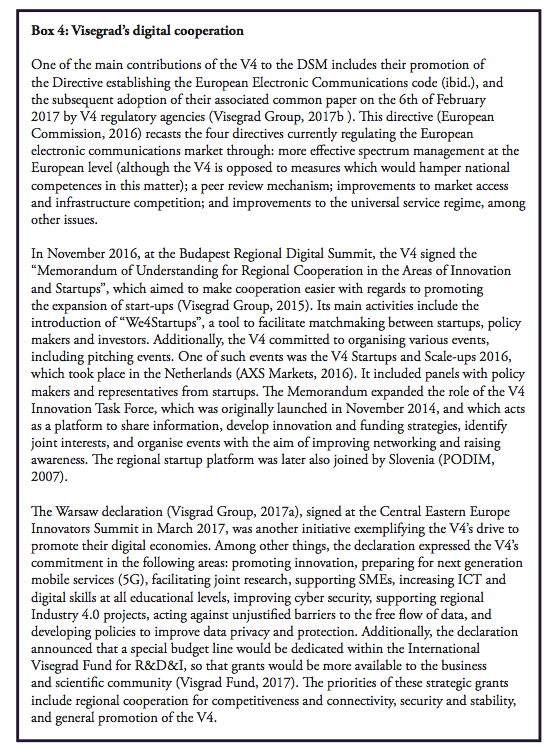 Digitisation is already today a key component in the V4 and, as an example, in March 2017 the Prime Ministers of the Visegrad countries adopted the “Warsaw Declaration” stressing their intent to cooperate in innovation and digital affairs (Visegrad Group, 2017a). That is a promising development, and one that now needs to be backed up by substance and good initiatives. Likewise, there is substantial bilateral cooperation between Spain and Portugal, two other convergers, and there should now be more attention given to the digital. Such new and intensified forms of cooperation within the group of digital convergers should focus on the regional level, including regions within countries. Digital convergers have high levels of digital inequality and there are regions with little capacity to build an economy in the back of digital endowments. These countries are not unique: regions within other countries also have very different endowments and perform differently in the digital economy. Still, the problem of digital inequality is a more important matter for many convergers because the lack of skill and ICT capacity prevents digitisation to ripple through the entire economy and lift productivity. As part of regional initiatives like the V4, digital convergers should also intensify their collaboration with other open economies that have managed to increase their digital endowments. Here, existing groups of countries such as the Nordic Council represent recurrent opportunities for different forms of cooperation (Office of the Prime Minister Norway, 2017). As previously mentioned, the group of Benelux countries are also good partners from which ideas and experiences can be imported. Cooperation with these groups can also involve areas that are not on the level of influencing EU policy, as digital convergers have the potential to profit from the lessons learned of these countries with regard to their process of increasing digital endowments. Evans, P. and Gawer, A. (2016) “The Rise of the Platform Enterprise: A Global Survey“. Center for Global Enterprise. Timmer, M. et al. (2011) “Productivity and Economic Growth in Europe: A Comparative Industry Perspective” in International Productivity Monitor, No. 21.